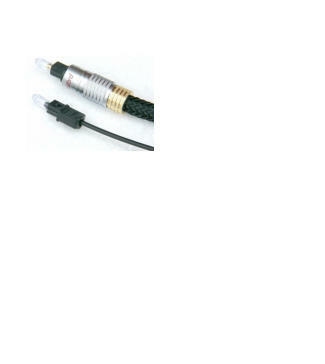 The TC-3618 TOSLINK cable Contemporary manufacturing processes and materials allow for a level of precision and performance in the TC-3618 that are unattainable in standard optical cables. The TC-3618 boasts a quality substrate, multi-fiber conductors, and low-loss flexibility. This provides faultless transmission of even the most challenging multi-channel digital sound track. There are two major problems that can make a difference in the sound of a digital signal: jitter and data error. - Jitter spreads the digital data out over time, smearing or blurring of the sound. 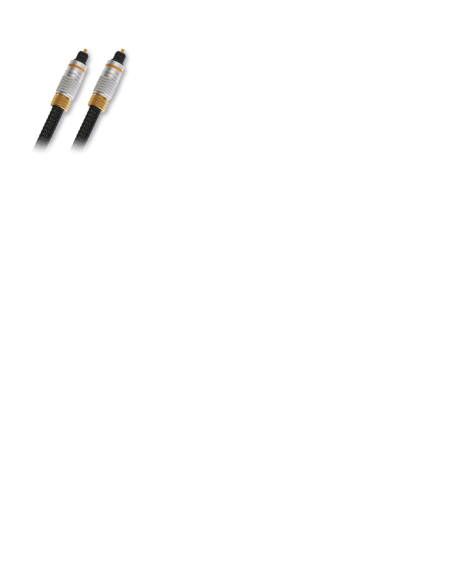 An often overlooked cause of jitter is bandwidth limiting of the digital signal. - Data error occurs when data arriving at the D/A converter is either missing or wrong. The reconstruction of damaged data through interpolation, would result in less obvious, but still compromising effects on fidelity. Assemblies using large fibers or just a single fiber assembly suffer from greater signal attenuation and reflection than multi-fiber assemblies. 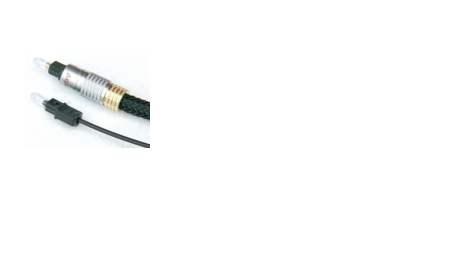 This occurs from bending the TOSLINK cable in order to connect up your equipment. 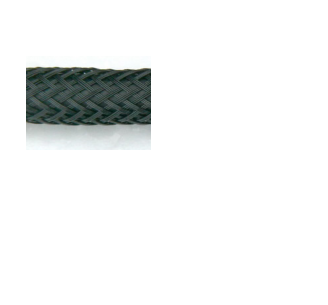 The TC-3618 is made from multiple fibers of a very small diameter and has a larger diameter than a standard TOSLINK. When the signal is multi-channel 24 bits audio and/or sampling rates over 96KHz, this bandwidth is critical. 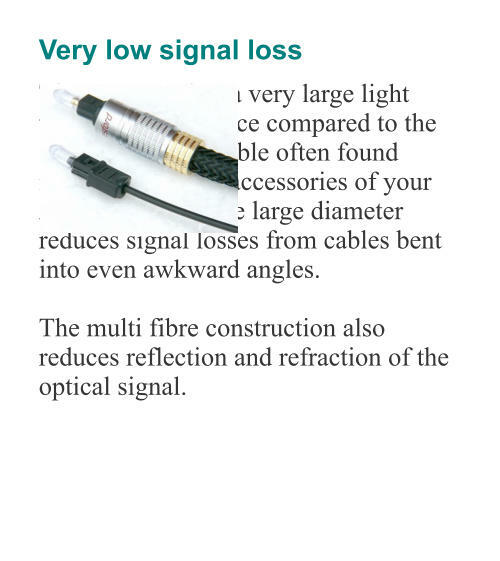 Very low signal loss The TC-3618 has a very large light transfer performance compared to the standard optical cable often found included with the accessories of your AV equipment. 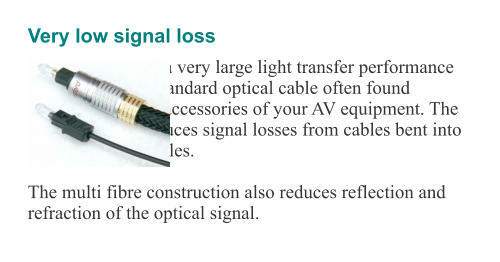 The large diameter reduces signal losses from cables bent into even awkward angles. 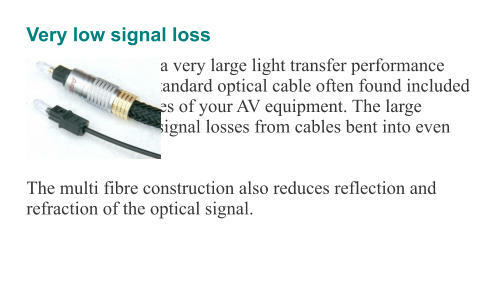 The multi fibre construction also reduces reflection and refraction of the optical signal. Protective Mesh In order to protect the critical fibre optic strands and its outer coating, the TC-3618 is held within a hard wearing multi strand protective mesh. 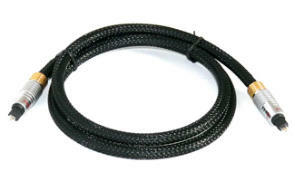 This reduces even further the chances of damage to the cable when running it through gaps or cable cut outs. The TC-3618 TOSLINK cable Contemporary manufacturing processes and materials allow for a level of precision and performance in the TC-3618 that are unattainable in standard optical cables. 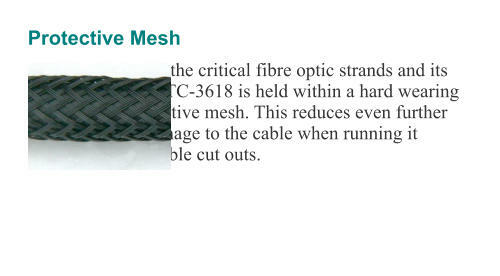 The TC-3618 boasts a quality substrate, multi-fiber conductors, and low-loss flexibility. This provides faultless transmission of even the most challenging multi-channel digital sound track. There are two major problems that can make a difference in the sound of a digital signal: jitter and data error. - Jitter spreads the digital data out over time, smearing or blurring of the sound. 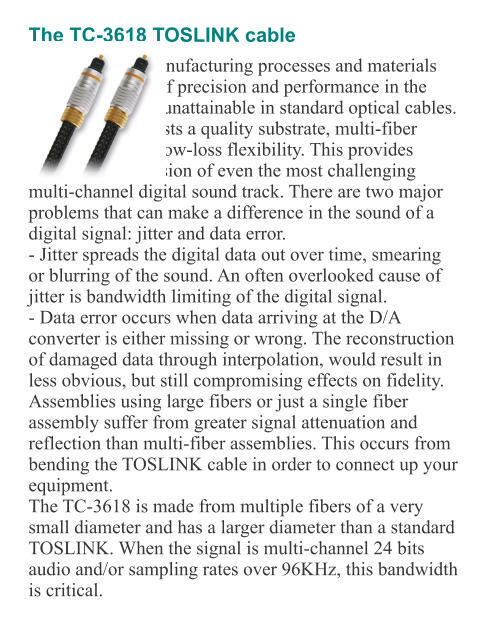 An often overlooked cause of jitter is bandwidth limiting of the digital signal. - Data error occurs when data arriving at the D/A converter is either missing or wrong. The reconstruction of damaged data through interpolation, would result in less obvious, but still compromising effects on fidelity. Assemblies using large fibers or just a single fiber assembly suffer from greater signal attenuation and reflection than multi-fiber assemblies. 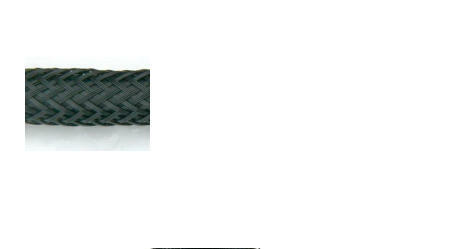 This occurs from bending the TOSLINK cable in order to connect up your equipment. 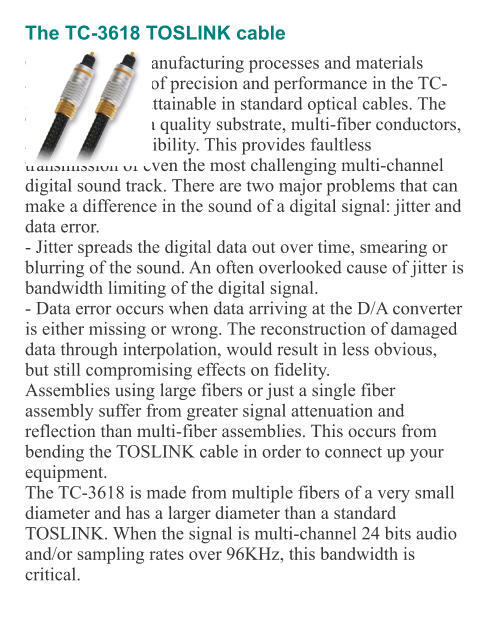 The TC-3618 is made from multiple fibers of a very small diameter and has a larger diameter than a standard TOSLINK. When the signal is multi- channel 24 bits audio and/or sampling rates over 96KHz, this bandwidth is critical. 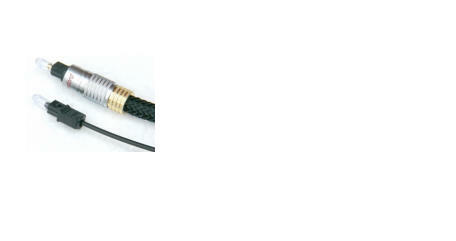 The TC-3618 TOSLINK cable Contemporary manufacturing processes and materials allow for a level of precision and performance in the TC- 3618 that are unattainable in standard optical cables. The TC-3618 boasts a quality substrate, multi-fiber conductors, and low-loss flexibility. This provides faultless transmission of even the most challenging multi-channel digital sound track. There are two major problems that can make a difference in the sound of a digital signal: jitter and data error. - Jitter spreads the digital data out over time, smearing or blurring of the sound. An often overlooked cause of jitter is bandwidth limiting of the digital signal. - Data error occurs when data arriving at the D/A converter is either missing or wrong. The reconstruction of damaged data through interpolation, would result in less obvious, but still compromising effects on fidelity. Assemblies using large fibers or just a single fiber assembly suffer from greater signal attenuation and reflection than multi-fiber assemblies. 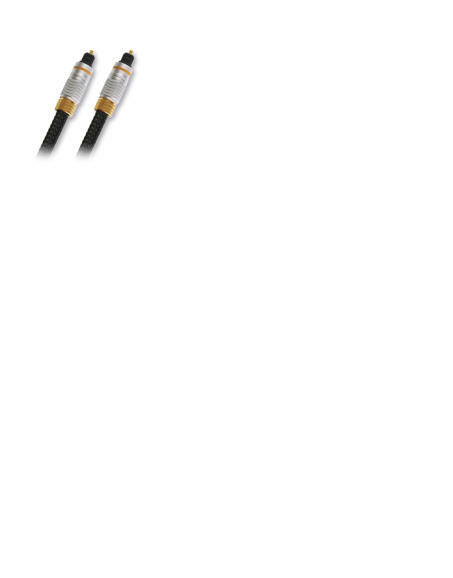 This occurs from bending the TOSLINK cable in order to connect up your equipment. The TC-3618 is made from multiple fibers of a very small diameter and has a larger diameter than a standard TOSLINK. When the signal is multi-channel 24 bits audio and/or sampling rates over 96KHz, this bandwidth is critical.